Benjamin Franklin and a group of friends founded the Library Company of Philadelphia in 1731 when Franklin was 25 years old. It was America's first lending library and can lay claim to being the predecessor of the free public library. For a brief period (Dec. 1733-Mar. 1734) Franklin actually served as the librarian for the Library Company. He also served as its secretary from 1746 to 1757. Initially the library was located in the private residence of one of its members. The Library moved to the Pennsylvania State House (now known as Independence Hall) in 1740. It stayed in this location for 34 years. 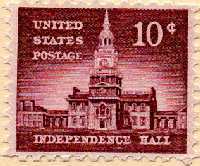 Independence Hall is depicted on several United States postage stamps and on some stamps of other countries. In 1773 the Library rented two rooms in a new building called Carpenter’s Hall. When the Continental Congress convened in Carpenter’s Hall in 1774, Members of the Congress were given access to the Library. The same courtesy was extended to future Congresses. Between 1774 until the Library of Congress was established in 1800, the Library Company could be considered the de facto Library of Congress. In 1790, the Library moved into its own building on Fifth St. where its stayed until 1880. 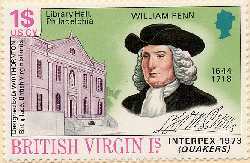 Library Hall is depicted along with William Penn on this 1979 postage stamp of the British Virgin Islands. It is one of the few free standing American library buildings depicted on a postage stamp. 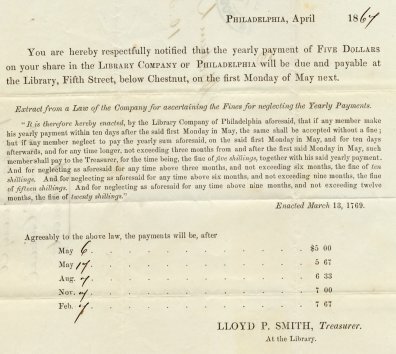 An annual statement of dues sent to a Library Company member by Treasurer and Librarian Lloyd P. Smith in April, 1864. On February 24, 1880, the Library moved into a new building at the Northwest corner of Locust and Juniper Streets. The envelope at the left was mailed just a little more than two years after that move. 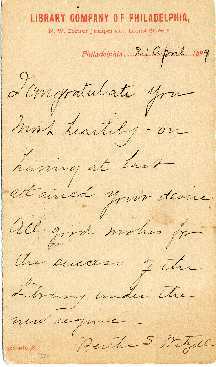 On this postal card mailed on April 21, 1889, Bertha S. Witzell, probably a Library Company staff member, writes a congratulatory note to Albert Durham, the new director of the Reading Public Library in Reading, PA. on his appointment. The Ridgeway Library building was given to the Library Company in 1878 as the result of an earlier bequest of almost a million dollars from Dr. James Rush. The building was reluctantly accepted by the Library Company and was never used as the primary service point of the Library. This picture postcard of the Ridgeway Library was mailed to England in 1904. George Maurice Abbot served as Librarian of the Library Company from November 7, 1907 to June 30, 1929. 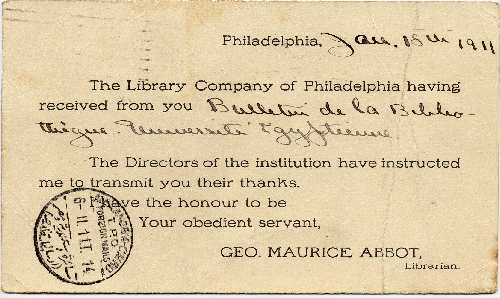 This postal card from Abbot was mailed on January 20, 1911 to the Librarian of the Egyptian University in Cairo to acknowledge a gift. 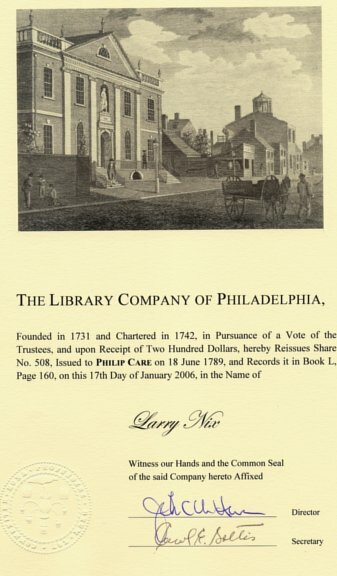 To help celebrate the 275th anniversary of the Library Company of Philadelphia I became a share holder of the Library Company. On January 17, 2006 I was reissued Share No. 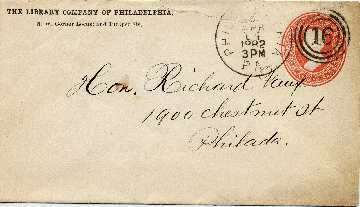 508 which was issued to Philip Care on June 18, 1789. Philip Care was the 2nd husband of Sarah Bartram Bertier. They both lost their spouses in the yellow fever plague of 1793 in Philadelphia. Sarah was the daughter of Isaac Bartram. He was a druggist and a member of the American Philosophical Society. His father was John Bartram, formerly the king's botanist in America and considered the father of American botany. John Bartram was a close friend of Benjamin Franklin and co-founder of the American Philosophical Society. This provides an interesting connection between my share and the founder of Library Company of Philadelphia. I'm grateful to Ken Piper, a descendent of Sarah Bartram and Claude Antoine-Bertier, for this background informatin on Philip Care. One of the perks of this status is receiving regular mailings from the Library. 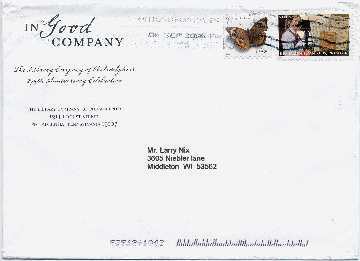 This envelope contained an invitation to "In Good Company" a reception, dinner, and program on November 8, 2006 to celebrate the 275th anniversary of the Library Company. 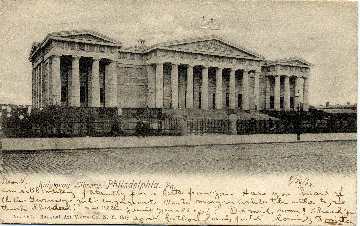 More on the history of the Library Company of Philadelphia can be found at http://www.librarycompany.org/about/history.htm . Also check out the Library History Buff Blog.